Evolutionary natural feeding. 90% lamb. 10% fruit & vegetables, herbs & botanicals. 0% grain & gluten, white potato. Lamb high protein. Ethical joint care botanicals. Freshly prepared. Good Shopping Guide - Ethical Company. Super-8 vegetables, fruits, herbs, botanicals & spices. Naturally made without artificial colours, preservatives, flavours and GM ingredients. 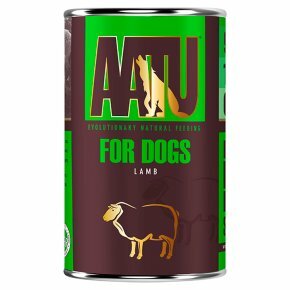 'They are what they eat' - feeding guide Although AATU is a highly concentrated feed and generally less quantity will be required to maintain a healthy weight, our table is a guide. We know that every dog is as unique as the family they live with. Factors including age, activity, metabolism and the time can also have an effect. Please check with your vet that your dog is at their correct healthy weight. Feeding Guide Dog Size: Up to 5kg, Cans*: Up to 1 Dog Size: 10kg, Cans*: 1 - 1 1/2 Dog Size: 15kg, Cans*: 1 1/2 - 2 Dog Size: 20kg, Cans*: 2 - 2 1/2 Dog Size: 25kg, Cans*: 2 1/2 - 3 Dog Size: 30kg, Cans*: 3 - 3 1/2 Dog Size: 35kg+, Cans*: 3 1/2 + *(suggested per day) Always ensure there is a fresh bowl of water at all times.